What is a Winnebago VISTA LX? Vista LX, Winnebago RV: You appreciate a great value, but you also appreciate some of the finer things a Class A coach can offer. Say hello to the Vista® LX. It combines the value and uncompromising quality of Winnebago® that made the Vista so popular, with additional standard features and four unique floorplans that raise the bar for feature-packed motorhomes. Triple sliderooms (NA 35F) open up new avenues for features such as bunk beds in the 35B and a dining table/buffet with a retractable HDTV in the 30T. 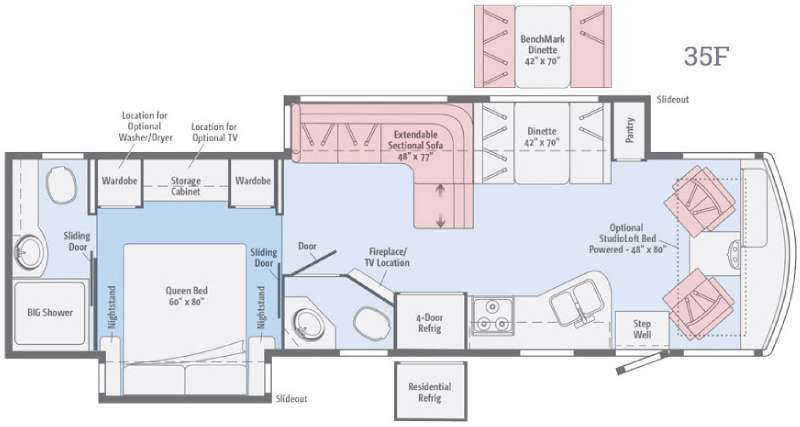 Popular amenities include Corian® galley countertops, sink covers, raised panel refrigerator inserts, and much more. All this at a friendly price makes the Vista LX the introduction to Class A living that you deserve.